When it comes to roast pork (Siu Yoke in Chinese), everyone has their own opinion on what's the best. 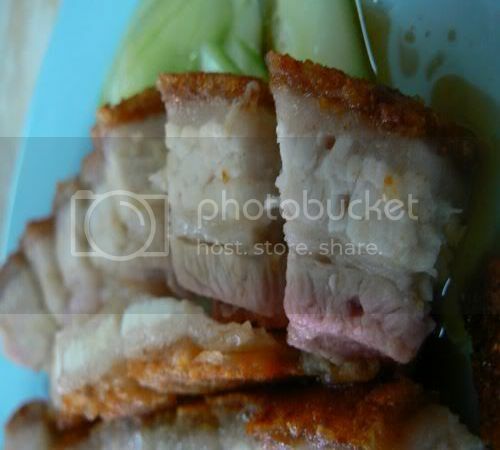 For me, my ultimate Siu Yoke has to have ultra crispy skin topping tender melt in the mouth meat. 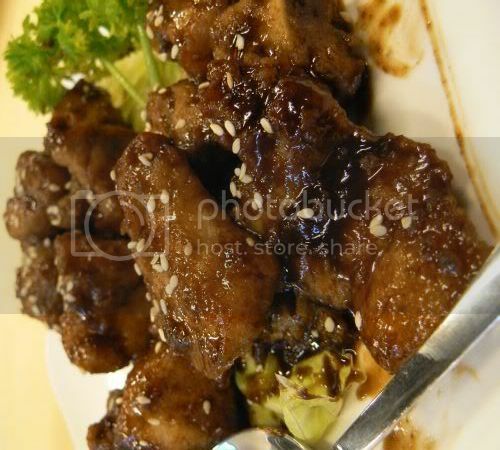 Recently we found one great contender for the ultimate Siu Yoke which fit all the categories perfectly. Only problem is, it also has layers of fats which makes it an extremely sinful bite each time you indulge in it. 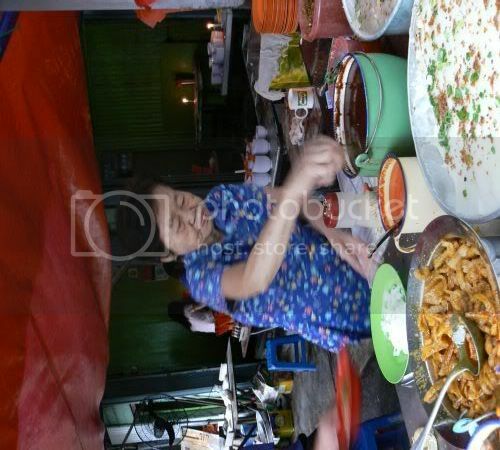 Located in a tiny corner shophouse in Pudu, just off Changkat Thambi Dollah, this place is suspended in a "twilight zone" from noon onwards with people queueing near the stall or just sitting around the tables waiting for the siu yoke to be ready. People only get animated when the owner walks in from the back with slabs of siu yoke. Once he gets to his stall, he starts chopping furiously to fill up the accumulated orders. If you love Siu Yoke, do try this stall as theirs is really unique - it has crispy skin on top and bottom, giving you double the crackle. Don't count the layers of fat in between as once you pop in it the mouth, you don't taste it as the fat melts straight away. Premium siu yoke like this does not come cheap so be prepared to pay slightly higher prices than normal here - around RM12 to RM15 for an order to be shared among two people. It's interesting to note how they make the siu yoke - instead of a high powered oven, they use just any oil drum filled with charcoal. The slabs of siu yoke is hooked on the side of the drum with metal hooks and roasted for almost three hours. Once it's ready, they'll open the oil drum and remove the slabs, brush it a bit if there are slightly blackish parts and it's ready to be chopped and served. Note also the owner of the stall is a proud recipient of a medal from the King, Jasa Pingat Kebangsaan (JPK) and has received lots of recognition from the MCA party with pictures of him with the policitians on his wall of fame. I'm not too sure if he is in involved in any other charities but he gets my vote for contributing to the community with his excellent Siu Yoke. Having lived in Petaling Jaya almost all my life, I often have memories about where my parents used to take me for family dinners. One of my fondest food memories has always been dining at New Formosa Taiwan Restaurant in SS2 which has been around for more than twenty years. 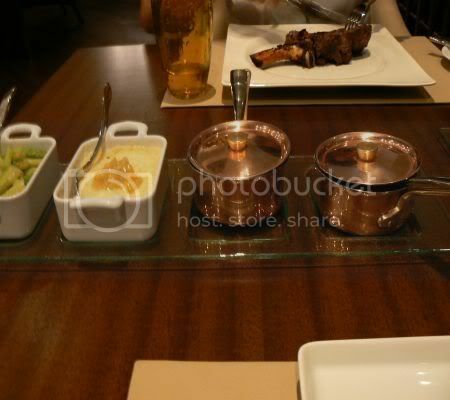 I always remembered their Stonefire Pot which we will have on special occasions, my favourite part was when they fry the beef with the hot spicy Taiwanese sauce in the hot pot which will be served to you. Subsequently the stock will be poured into the pot and you can cook the ingredients inside it. Revisiting this place recently was great because I discovered the food tastes just as fantastic. 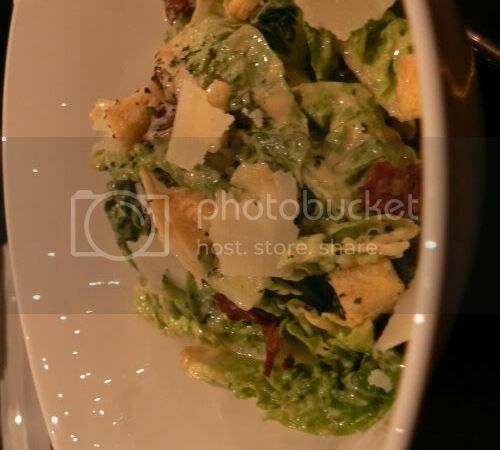 The restaurant has of course branched out from serving the Stonefire Pot and the menu is filled with so many choices that one has a hard time determining what to order. We loved their Bamboo Yam Rice that is served in a bamboo tube. 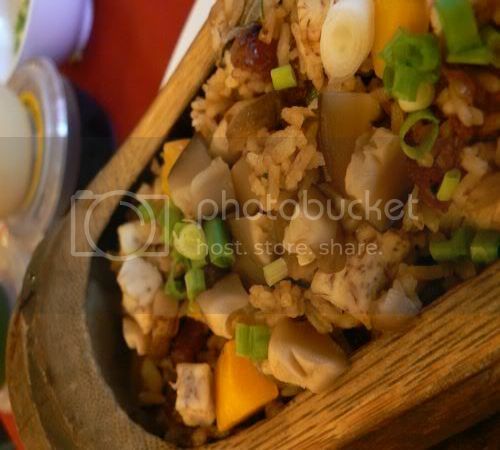 The fragrant rice is filled with chunks of yam, pumpkin, chinese sausages (Lap Cheong in Chinese) and chinese mushrooms. Even though I don't take rice most of the time, I finished my portion of this quickly and wished I could get more. 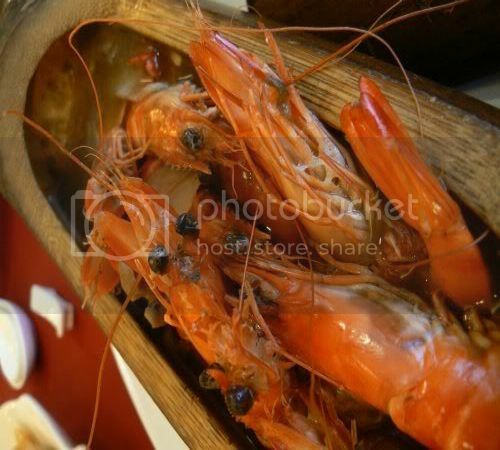 They also serve Bamboo Prawns whereby the prawns is steamed in the bamboo tube with ginger and wine. 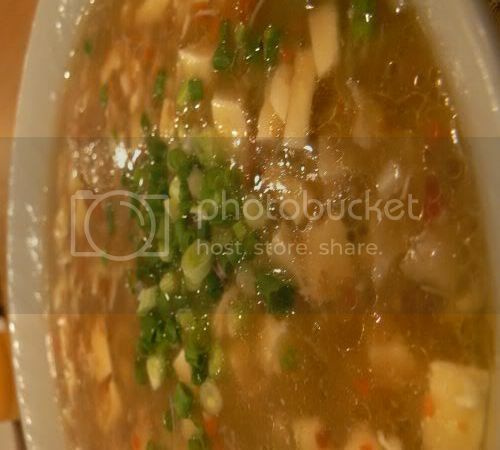 Subsequently, herbal soup is added in the bamboo tube and served to you. 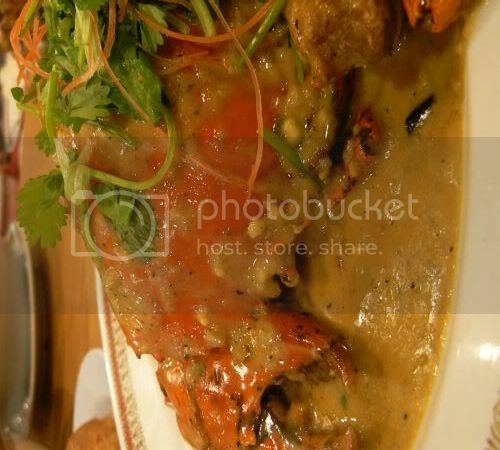 We enjoyed the combination of the sweet prawns and the light tasting herbal soup. This was my absolute favourite and definitely one of the best Butter dishes I have eaten so far - their Butter Unagi which is cooked Taiwanese style. It's slightly different from the usual type we get in the restaurants with the butter shreds but the mix of the butter, egg, flour plus the curry leaves and sliced chilli padi (bird eye chilli) is irrestible. The unagi is soft that you don't think you're eating eel. They also do a version with prawns which I will definitely revisit to try. Even my mother gave her thumbs up to this dish which is a great surprise since she doesn't really like fried items. Besides dishes you can order to eat with rice, the restaurant also serves porridge with sweet potato. 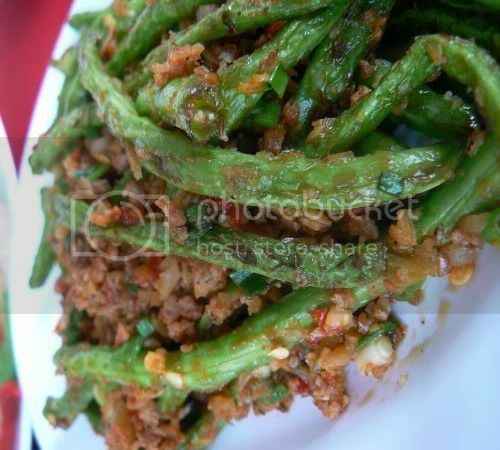 You can order dishes like these Dry Cooked String Beans in Szechwan style. This was my favourite dish when I was a kid as I loved the combination of the soft beans with a slight smoky taste combined with crunchy preserved radish. Besides this dish, there are fried bittergourd with salted egg yolk and ikan bilis, choy poh(preserved radish) omelette, steamed minced pork with Taiwanese pickles, stewed pig intestines with pineapple, Japanese seaweed, golden mushrooms with loofah and etc which all go well with porridge or rice. They do a lot of duck dishes here but I liked their Szechuan Duck which is marinated with salt and Szechuan pepper then steamed and deep fried. It's nice and crispy when served. We had quite a lot of duck as leftovers which we ate the next day and it still tasted great. Dip it in chilli sauce or plum sauce for extra flavour. This time round we tried their hotpot with bonito stock or cai yu which is how the Taiwanese call it. The soup is sweet and once you throw in everything above i.e. 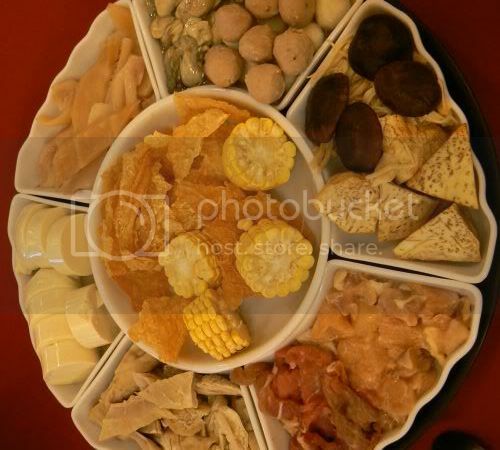 the yam, mushrooms, chicken, cabbage, corn on the cobs, bean curd skin, pork balls, oysters, tofu, it tasted even better. Great for those rainy nights we have been having lately. A must have for dessert is their unique sweet yam Taiwanese style. Making it is such a great show as they mix chunks of yam in a hot honey sauce with lots of sesame seed. It's dipped in ice cold water for the honey to caramelise and served immediately. If you have eaten caramelised apples in fun fairs (not sure if they have this here) or toffee apples in Chinese restaurants, this is better as the yam is nice and floury inside while the outside is hard and crunchy. 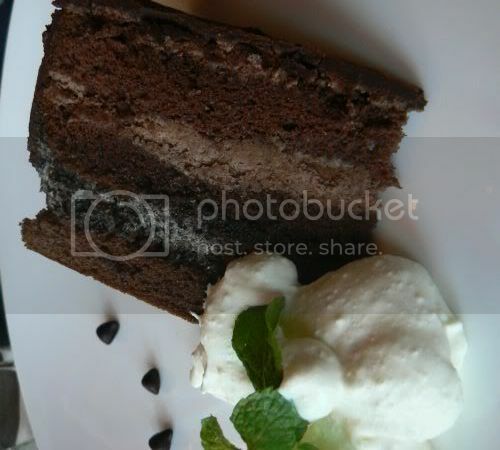 Besides the restaurant, Formosa's management also sells their desserts in kiosks in Giant Subang Jaya and Kelana Jaya. 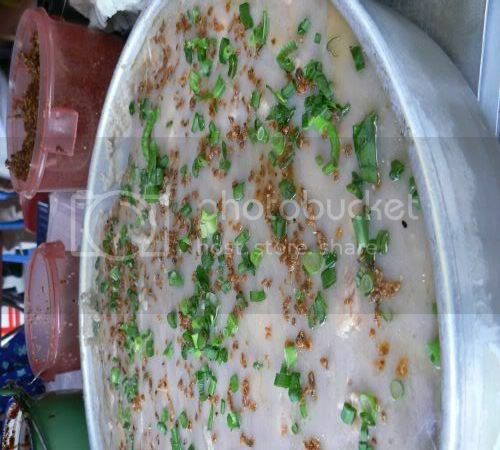 You can get puddings like the famous Nien Koh made from yam and gingko nuts, caramel custard pudding which is yummy, herbal puddings like Kuai Leng Kuo, green tea and aloe vera pudding. 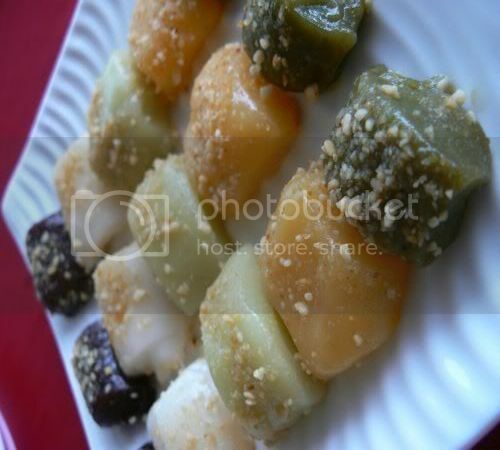 They also serve Mua Chee in different flavours - pandan, plain, coffee and mango that is tossed in a mixture of crushed peanuts. All of you must be thinking I have gone crab crazy since almost every weekend, we have had a crab dinner but due to farewell and birthday dinners, we seem to be at a seafood place every other weekend. This should be the last one for quite some time. This time round, we decided to go really off tangent from our usual hangout places to try De Foodland in Bandar Menjalara for my friend's birthday. This place is well known for serving crabs cooked in thirty different styles - Creamy Butter, Salted Egg Yolk, Hot & Spicy, Black Stout, Steam with Chinese Wine, Mee Hoon Fried, Marmite and etc. Luckily we had booked a table for last night as the place was packed to the brim with people. To start off the meal, we had lots of vegetables in a form of Spinach in Superior Soup (Siong Tong Yeen Choy in Cantonese, RM15++) and fried brinjals (aubergines), okra and french beans in a sambal dry sauce (RM25++). The vegetables were pretty good and extremely tasty. 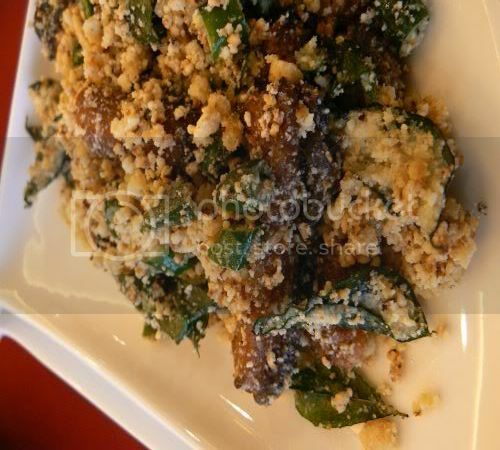 The spinach was topped with sliced century egg and tiny ikan bilis (anchovies in Malay) to add extra flavour. We ordered a total of 2.8kg of crabs which was being sold at RM40 per kg (RM112++). I felt it was extremely pricey since there's lots of promotions in town selling crab at RM38 per kg now. We ordered two styles - salted egg yolk (as above) and creamy butter crab (below). The salted egg yolk crab is done differently here as it's creamier versus the dry version served in King Crab. This was pretty good but we felt the crab was not as sweet and juicy versus the one we ate at King Crab. The creamy salted egg yolk sauce was tasty and creamy. Highly dissapointing was their signature dish - the Creamy Butter Crab as the sauce was tasteless. Not sure whether this is due to the kitchen buckling from the weight of so many diners that night. 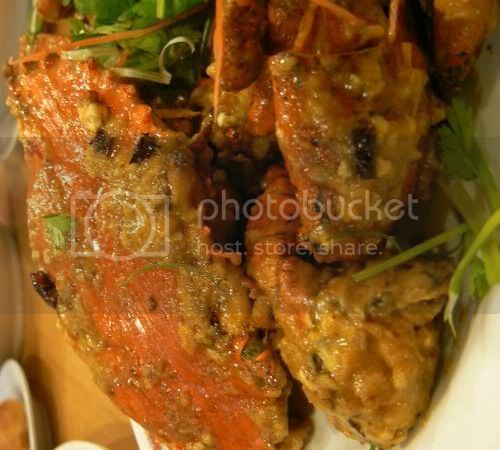 The sauce is also thicker than normal and we felt the crab in Pantai Seafood cooked with butter sauce is much better even though the sauce was too thin. 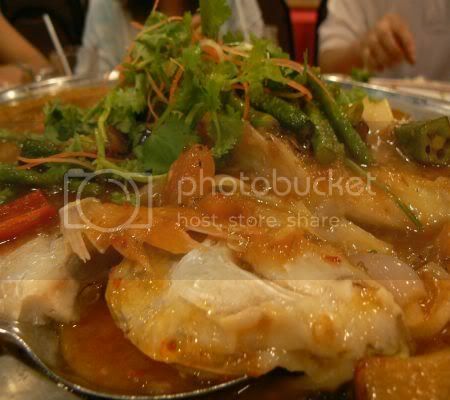 We had a steamed fish with assam sauce (RM23++) which was pretty good but the fish looked kinda smashed up hence the picture looks quite bad. This was a favourite among the kids and adults - the herbal type soup with tofu cubes and kei chi (Wolfberries in Chinese, RM12++). Overall, we thought the other food was not bad but the crabs were dissapointing. We all felt the crabs were of better quality in King Crab and cheaper since they're now having their RM38 per kg promotion. 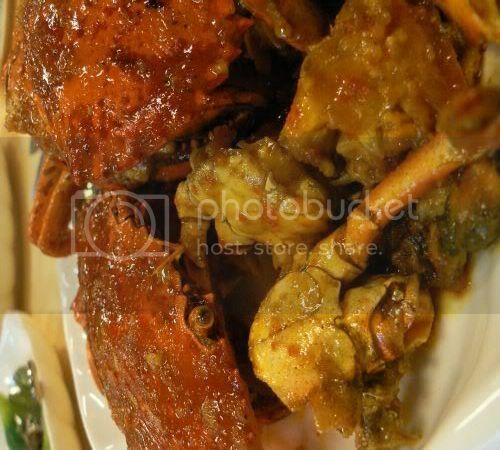 We thought the quality of the butter sauce for the crabs was compromised due to the huge demand for the crabs. I reckon my mother's house is turning into a zoo with all the animals that hang out there. This past week, we had one really gorgeous ginger cat hanging out the house because he decided he wanted to become Fluff Puff's first boyfriend. Since we didn't want to be grandparents, we sent her to the vet straightaway. 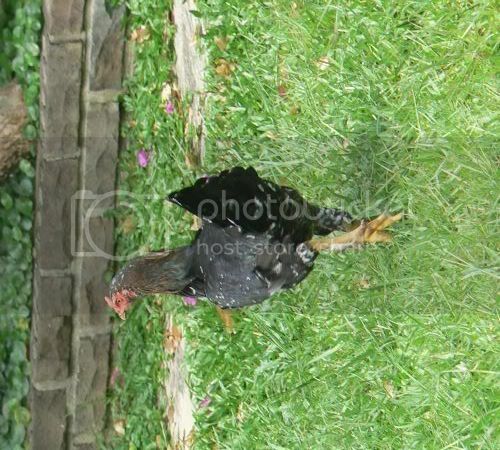 Then yesterday when I was there, there was a chicken running around the house yard! !Considering we live in the city where free roaming chickens are rare, I reckon this chicken must have ran away from someone's soup pot. 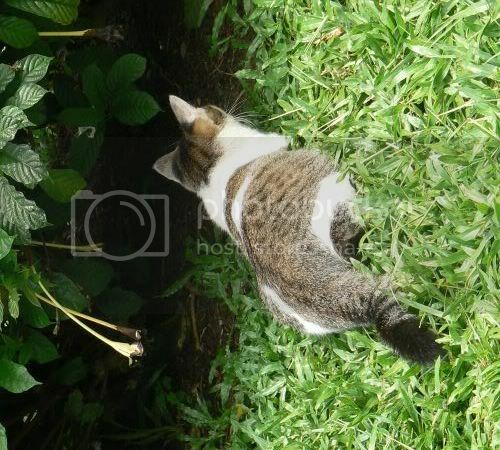 The boy cat was of course curious about this strange creature (it was their first time seeing a chicken) and he wanted to be friends but the chicken kept hiding in the bushes. It would have been priceless to snap a picture of him and the chicken but no one wanted to do a photo shoot that day. The chicken finally came out of the bushes and beat a hasty pursuit to the other side of the house. Not sure where it eventually went but hopefully it managed to run away from being thrown in someone's pot. Weekend Cat Blogging (WCB) is being hosted by the House of the (Mostly) Black Cats so hop there to see all the kitties. Happy Thanksgiving for those who are celebrating. I guess since we don't have turkeys running around, this chicken is my substitute. One night, we both decided to grab a very late dinner at this restaurant. I've heard about their famous Roti KLCC hence I was really lucky to be around when a large group of people ordered it and I got to snap a picture of it. It's basically Roti Tisu (Tissue Bread in English) - roti canai which is pulled until it's super thin and cooked on a hot plate with lots of margarine until it's really crispy. Usually sugar is sprinkled on top to make it crispier and add a bit of flavour to it. 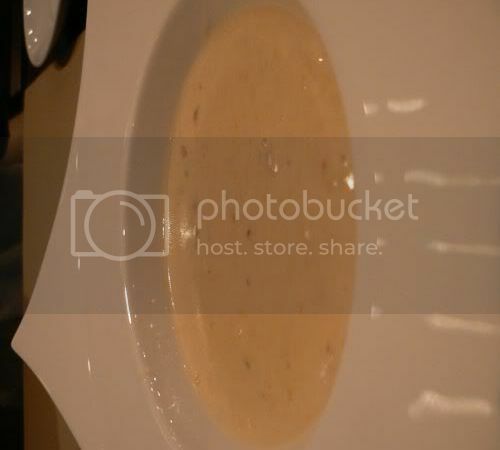 Some restaurants drizzle condensed milk instead of sugar. This restaurant came up with an innovative way to serve their Roti Tisu based on the Malaysia's most noticeable landmark, the 88 storey Petronas Twin Towers which we usually refer to as Kuala Lumpur City Centre (KLCC). Sadly there's no skybridge linking these two towers just like the real one but I think this is a great version. The towers are made by attaching the long and crispy tissue bread over two metal poles hence they can stand tall and proud. Next time, drop by this place and order it as it's RM5 for this amazing wonder of Roti Tisu. It's great with sweet teh tarik and shared among lots of friends. Kayu Nasi Kandar also does a similar Roti Tisu version except that theirs is taller and served like a tower (maybe they can rename it KL Tower?). 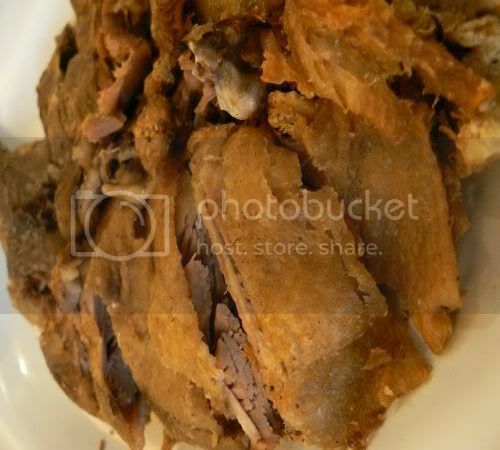 See the following links for pictures of Kayu Nasi Kandar's ginormous Roti Tisu. I took the plunge yesterday and finally met some food bloggers (a.k.a floggers) namely Fatboybakes from Have Your Cake and Eat it Too and his compatriot, Jackson from ^^Living in Food Heaven^^. 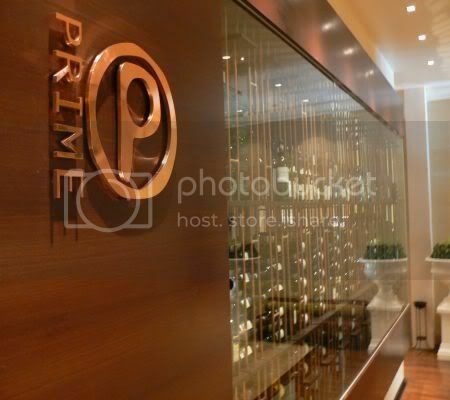 Venue for the momentous meet was the hot and happening restaurant, Isthmus in the newly opened Northpoint, just across from Mid Valley Megamall. It was extremely great fun to meet people who could talk about food and yes, we snapped pictures of lunch to our heart's content. On to the food which was really good. 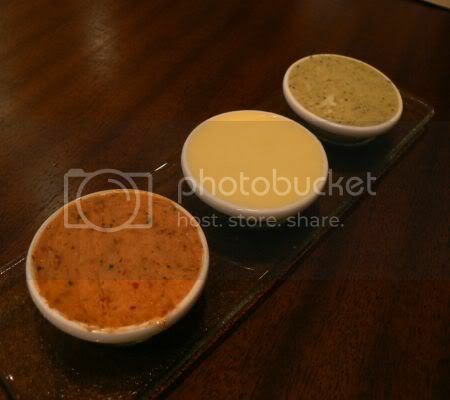 The restaurant is part of the famous Isthmus of Kra and Shakahari in Melbourne, Australia. 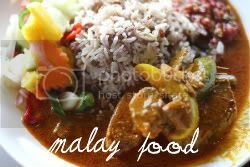 For lunch, they're currently offering combinations of appetizers and mains for RM25++ to RM55++. We tried their famous Lotus Blue Dumplings made from the natural dye of the peaflower that is delicately shaped by hand to resemble a flower. 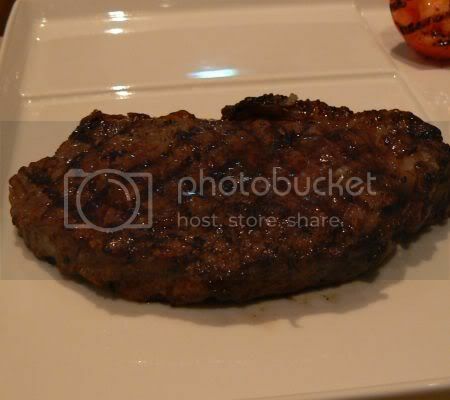 It's stuffed with caramelized minced chicken and drizzled with garlic oil. Tasted fantastic and looked really good too. Next appetizer was the Crab Agnolotti which was a flat gyoza filled with a mix of crab meat and fish paste. 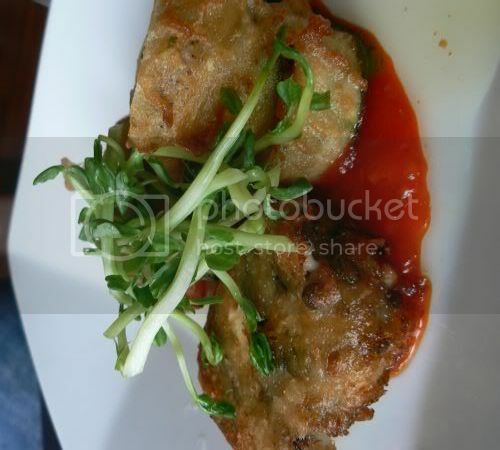 It's shallow fried in basil infused chili oil and served with black vinegar sauce. I found the sauce to be quite sweet though and it overpowered the delicate flavours of the crab meat. 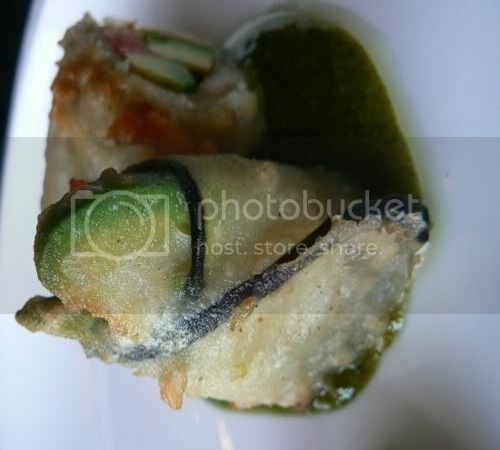 This was another appetizer called Simply Avocado which was avocado rolls wrapped in eggplant and fried in a rice almond batter. I like the taste of this since I love avocados and eggplants. The roll was also very nice and crispy as the batter is quite light. The last appetizer we had was the Lentil As Anything which was an interesting croquette made from lentils, yam, roasted asparagus and herbs. You can't really taste the lentils but you get hints of the yam making you think a bit of a crispy Wu Tau Koh (Yam Cake in Chinese). This was served with Avocado Rolls on the side. 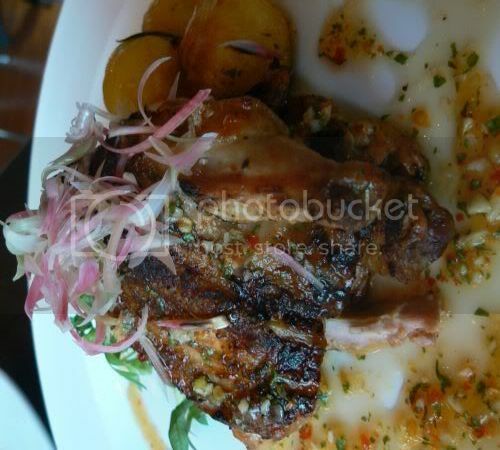 We had three main meals, two which were the Spring Chicken Medina that was ovengrilled spiced spring chicken served with a tangy dressing made from rice vinegar. This was served with tiny roast potatoes. Chicken was juicy and crisp from the grill. This was my favourite - their Din-Kum Duck. The free range duck was tender as it had been cooked in a semi confit (with duck fat) and the skin was crispy from being fried. 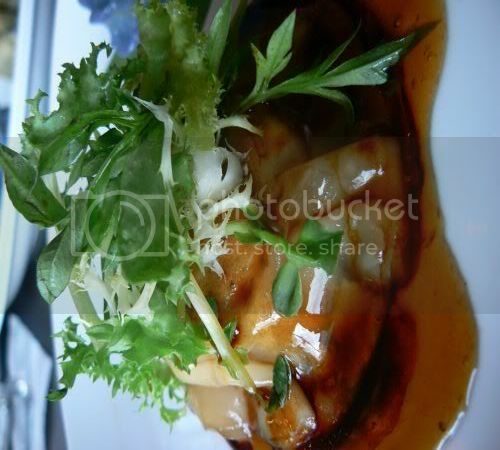 It's served with blood plum sauce which complements it really well. We had to have their desserts as they looked great - just like the ones you get in Alexis. First was the decadent Chocolate Oreo Cake - light as air chocolate sponge layered with chocolate mousse and crushed oreo cookies layer encased in a chocolate ganache. Yummy till the last spoonful. Next was a tangy Lemon Meringue Pie served with candied orange peels and sliced kumquats. 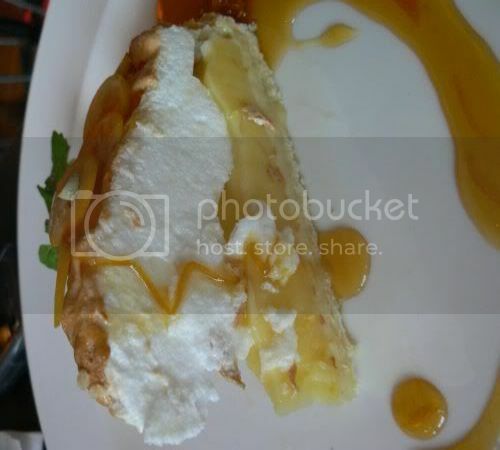 The meringue was so light which complemented the lemon tart. It was great fun meeting up with floggers (thanks to Fatboybakes and Jackson for meeting up with me) that we must do it again. I guess Bak Kut Teh in Klang is the next item on the agenda as I heard Jackson is an expert in that area. Do check out the restaurant and bar - it's really nice with their super high ceilings, a platform made from wood and yummy food. The apartments look swanky too from where I was and definitely a good place for anyone who wishes to be right in the center of things since Mid Valley Megamall and the offices are just a hop and a skip away. Recently I reckon, I have been eating so much crab that I have become an expert in determining which kind they are. Last weekend, we had a farewell dinner for a friend of mine who's emigrating to Australia which everyone seems to be doing nowadays. Hence we decided to try out this new place near my friend's house based on her colleague's recommendation. First off, dinner didn't start off as planned since we got hit by a massive rain storm. Since my friend and I had already gone there as per the scheduled time, both of us sat around catching up on what's new. He was hungry hence he ordered a few dishes as appetizers while waiting for the rain to subside. From what I read in the menu, this restaurant is a branch of Seafood Station which is located in Singapore. This is their second Malaysian outlet with the first one in Jalan Ipoh. 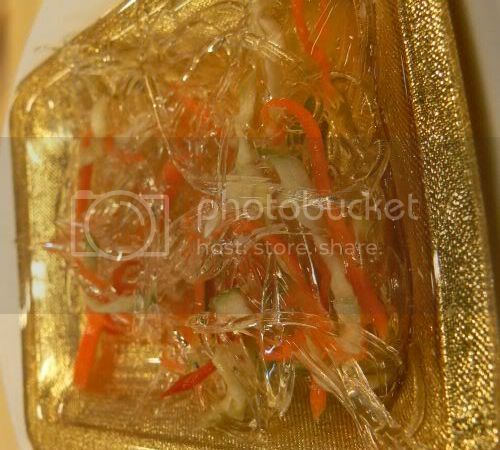 We started off with their appetizers which was fake shark fins (made from gelatine) mixed with shredded vegetables lightly tossed in a vinegar dressing (RM3++). Not that great but kinda interesting. 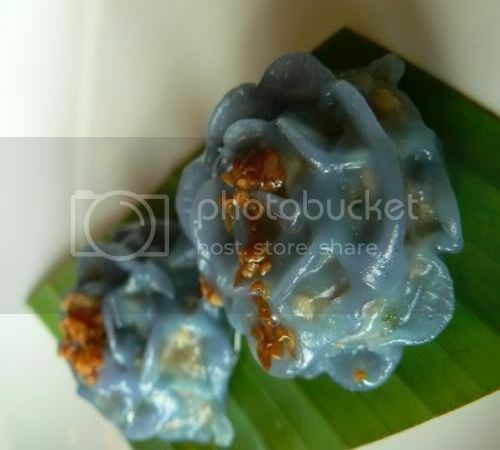 Next was their Oat Sotong(RM20++), which came with lots of crispy oats tossed in the sotong coated in a crispy batter. I liked their sotong which was nice and crispy and the strips of lemon rind they added to the dish. However, they added too much sugar to the whole dish that it was too sweet. My friend was really hungry hence he ordered a small portion of the Crab Fried Rice (RM10++) - we both didn't think it was good as the rice grains was too soft. 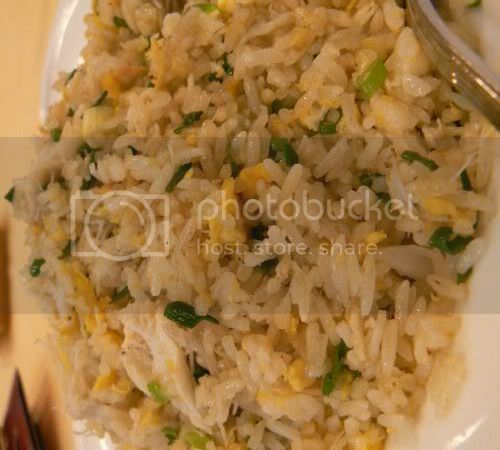 Usually for perfect fried rice, you need to use overnight cooked rice which is allowed to dry out. We suspect they use freshly made rice for this dish. Once the rain subsided, we started ordering dinner almost one hour later. 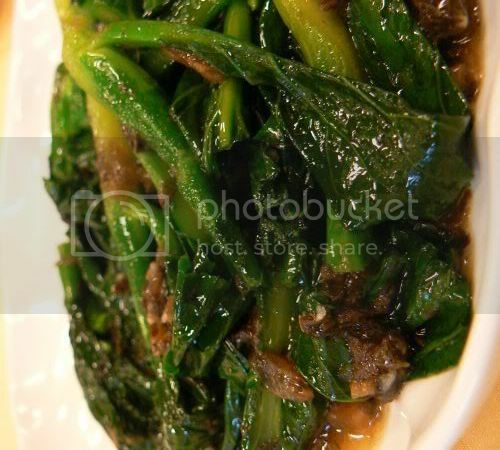 They have the two type kailan we had in Pantai Seafood but since we wanted something different, they ordered this unusual dish - kailan fried with mui choy (RM20++), a kind of preserved vegetable. 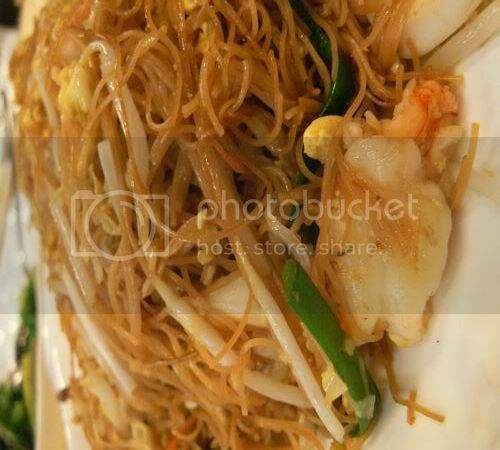 My friend wanted noodles hence they ordered this Seafood Fried Mee Sua (RM15++), although it was nicely fried, the chef had added too much salt into the dish making it difficult to eat. 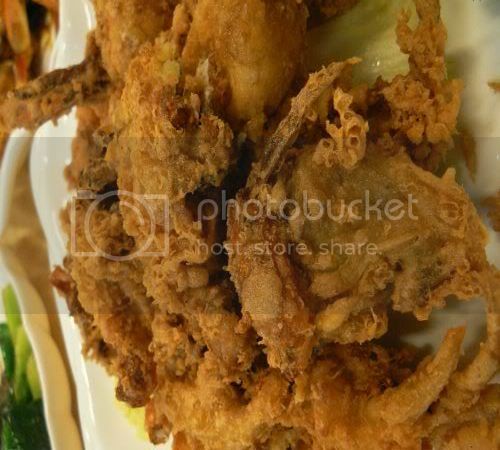 Originally we wanted to try their fried tea leaf prawns but they had run out of prawns hence we opted for their deep fried soft shell crabs (RM45++). This was nice and crispy but sadly too salty that you needed extra water to eat a piece of it. We were recommended the coffee pork ribs (RM20++) by my friend's colleague but this dish we felt the sauce that coated the pork ribs were too bitter tasting when it should be more sweet and caramelised. 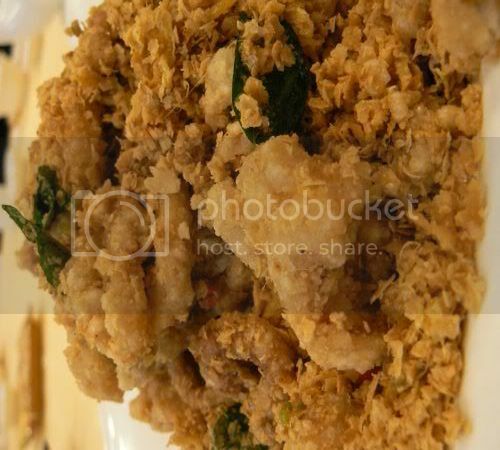 Their saving grace was the crabs which was fried with salted egg yolk (RM38++ for two pieces of crab). Although I didn't like the salted egg yolk mixture they used - it was too salty as they didn't smash up the yolks properly, the crab they used was really nice. 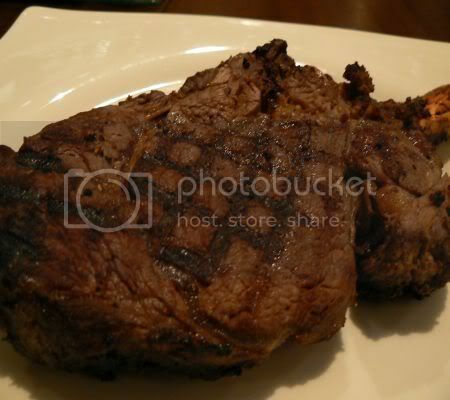 The meat was fresh and came out in chunks which reminded me of the ones we had at King Crab. They also cut the crabs to smaller pieces to make it easier to eat. 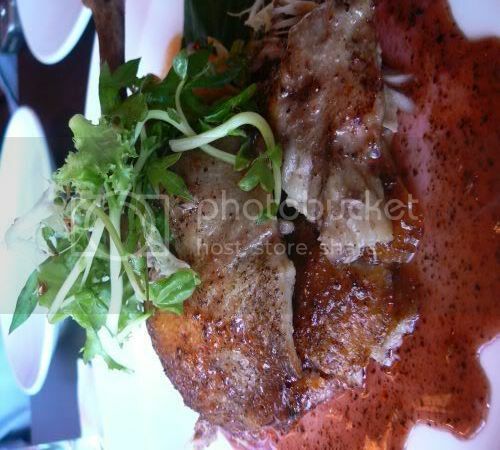 Based on their calling card, they serve 12 unique crab dishes including the Singapore Chilli Crab and Black Pepper variety. My friends say they don't mind returning to this place as they liked the crab since it's also near the house. Only thing is I reckon you can only eat the crabs since all the dishes were either too salty or sweet. One theory we have was the chef was suffering from heat stroke that day hence his tastebuds went haywire as my friend's colleague said the food was good the last time he ate there. If any of you have tried this place, do drop me a comment as it'll be interesting to see if this was just a random incident and the food here is actually quite good. Since yesterday was an overload of pictures, I reckon today's post should be kept to a minimum to ensure internet connections work smoothly. I have been looking for this particular stall for the longest time but since they shifted, I was not sure which shop they went to. Recently, a friend pointed out to me which shop they had gone to hence I could finally visit them to try their famous chicken rice wine noodles. Incidentally, Jalan Alor in the mornings is nice and quiet compared to the crowds of tourists hanging out here at night. Run by two sisters (I only saw one sister that day when I ate there), this stall has been in business for more than thirty years. 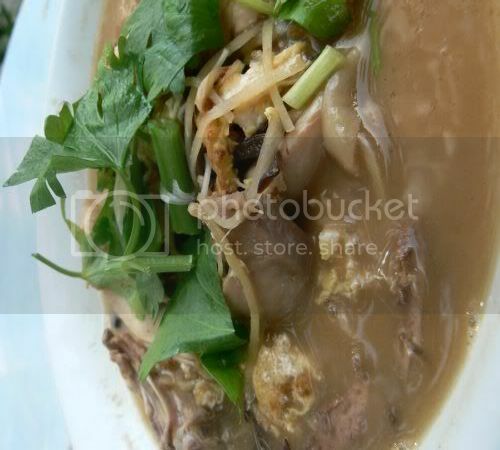 Their specialty is the chicken rice wine noodles which is extremely slurp worthy. The soup is so sweet tasting with young ginger shreds, black fungus shreds and tender chicken that I finished everything till the last drop. Although it's a bit pricey at RM8.50 for a bowl with an extra fried egg, they don't skimp on the rice wine here hence you taste it in every spoonful of the broth. Besides these noodles, I also saw the lady preparing curry noodles. 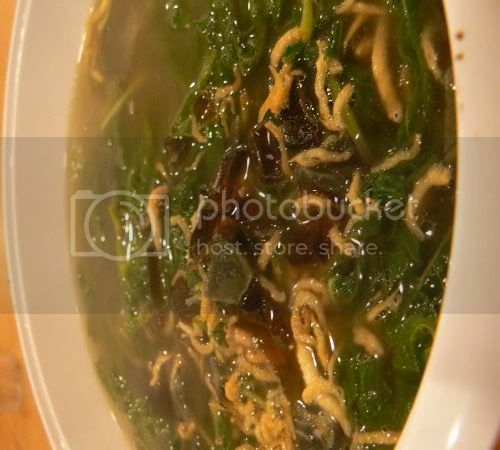 She also does a pork intestine and offal version in the same rice wine soup. After hearing and reading a lot about this book from Chubby Hubby and Kuidaore, I knew I wanted to get a copy of *Justin Quek's book. I searched high and low around Kinokuniya in KLCC plus Borders in Berjaya Times Square and even called up MPH as I was told they were the distributors but no one had heard about it. Faced with no sign of the book, I decided to get Splashie Boy to purchase a copy for me in Kinokuniya, Singapore and the book got back on Sunday night. Ever since then, it's been my bedtime read, making my mouth savour with all it's delights. 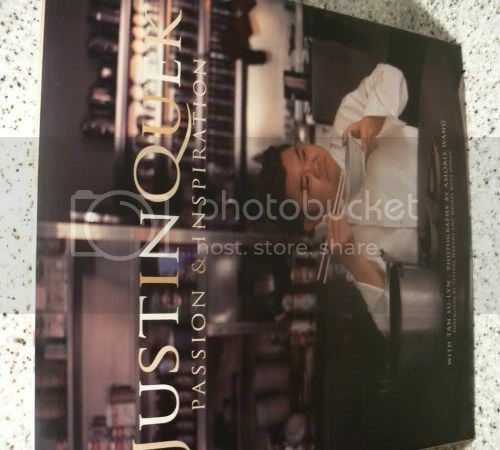 I love the stories Justin shares on his journey to being a chef, his childhood memories and the foods that tweak those happy thoughts. 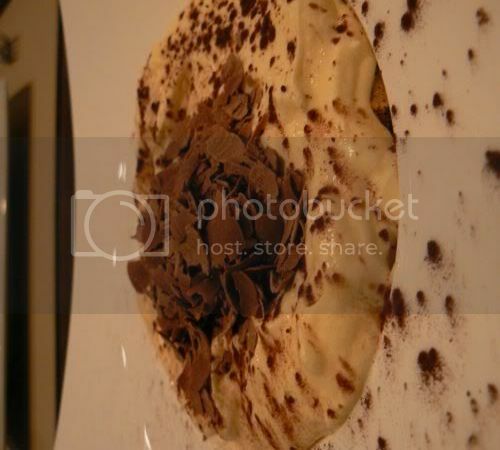 The pictures of the food are superb but sadly a lot of the ingredients aren't readily available here or even if they are, they'll definitely be priced at a premium. 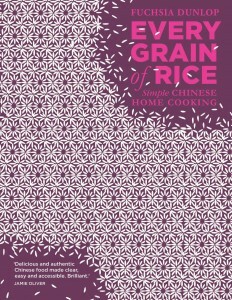 If you appreciate good food and love cookbooks, this is an ideal book to add to your collection. Incidentally, Chubby Hubby and wife have a hand in this book - he edited it while she helped Justin Quek write it. *I realised most Malaysians may not have heard about Justin Quek since he is Singaporean hence here's a short note on him. Read more about him on his website based on the links above. He's legendary in Singapore for his interpretation of French cuisine especially when he was in Les Amis. Currently in Taipei, he is chef-owner of La Petite Cusine with plans to open another restaurant in Shanghai. Lots of pictures today as everything at this particular stall is so good. If you don't mind ramshackle sheds, dirty looking alley ways and wandering at night, do try this tiny lane in Pudu, just before Jalan Pasar for superb food. I've been featuring other stalls from this lane also known as Wai Sik Kai (Gluttons' Lane in Chinese) such as the tong sui stall and the chee chap tong couple. I absolutely love this stall which offers a large variety of food: chee cheong fun, pak koh (white rice flour cake in Chinese), Wu Tau Koh (yam cake in chinese), yau char kuai (Chinese crullers), Nyonya kueh and tong sui at this particular place. Not all the items are made by the stall owner and some are either sourced from others and sold here. They only make the curry sauce themselves which is superb. 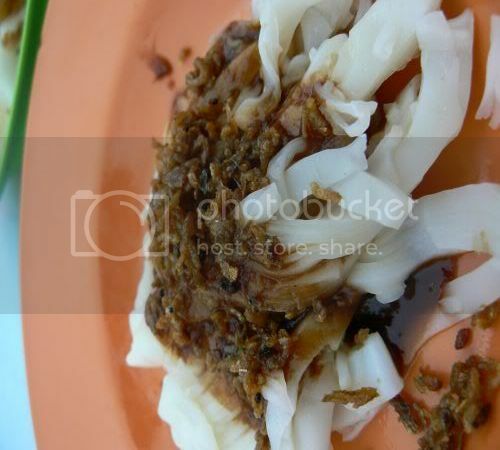 First is the Wu Tau Koh which is made from a mixture of yam and rice flour. The yam is usually steamed ahead and either shredded or cut into cubes. Some people prefer adding cubes of yam in their Wu Tau Koh as it's chunky while others prefer it totally smooth. 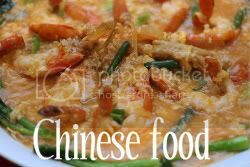 As flavouring, dried prawns and chopped spring onions are sprinkled on top. 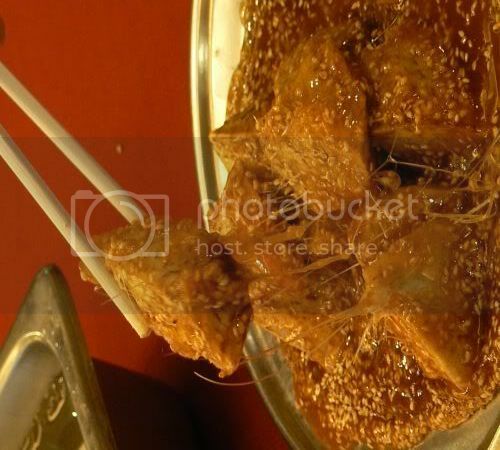 This particular Wu Tau Koh does not have much topping and is eaten with the sweetish sauce known as Thim Cheong in Chinese. 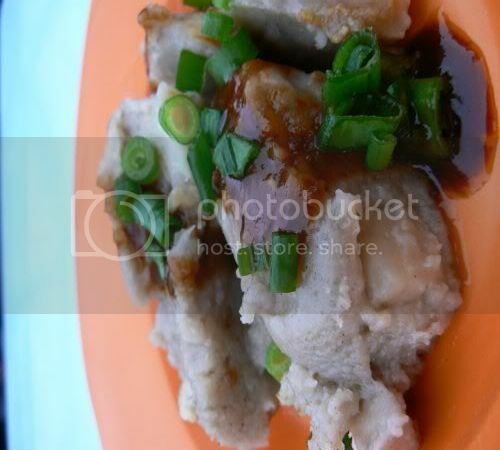 The sauce is made from soy bean paste and also eaten with chee cheong fun. 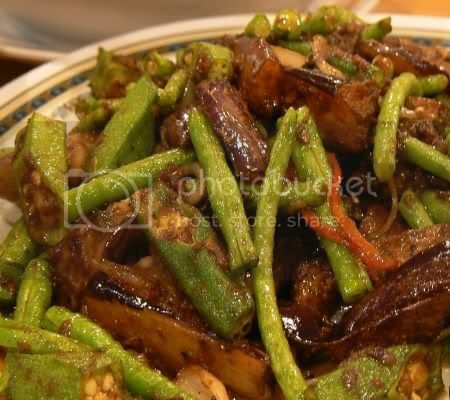 Excellent stuff especially with tiny chunks of steamed yam to add additional flavour. 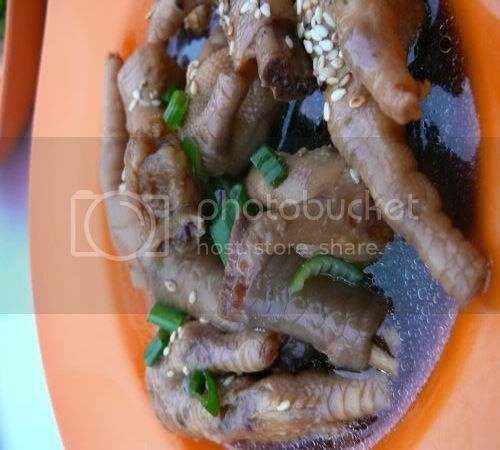 Besides the usual thim cheong and chilli sauce for you to add into the items you order at this stall, you can also request for these soy sauce chicken feet. 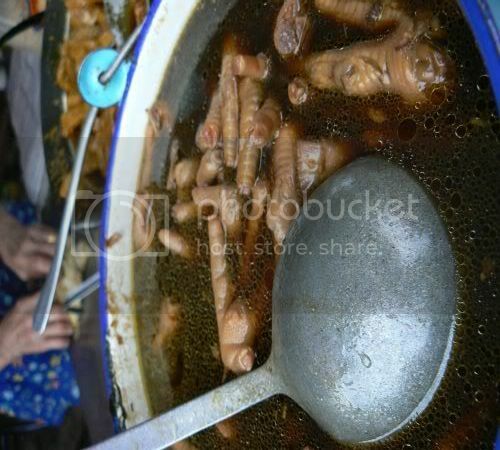 Cooked in a metal pot, the chicken feet is braised till tender in soy sauce and lots of black peppercorns. I love these and you must have lots of patience to sit down and slowly eat them to get the tender skin and meat out from the bones. The flavours are not too overpowering in this dish and very subtle. They were also serving Pak Koh (White Cake in Chinese), something you don't usually see all the time. 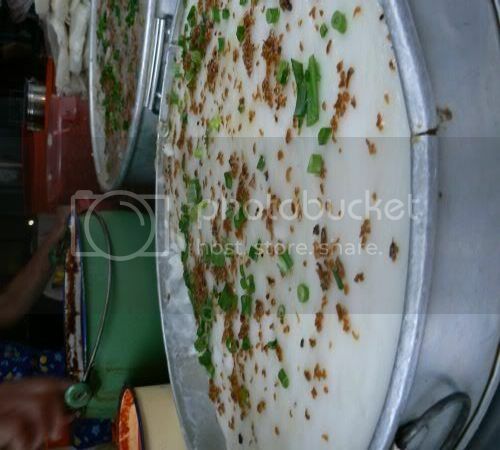 Similar to Woon Chai Koh, which is also made from ground rice flour, this was served in a large metal tray versus the tiny cups or bowls that Woon Chai Koh is served in. Texturewise, it's softer than the Woon Chai Koh and eaten with different condiments here. 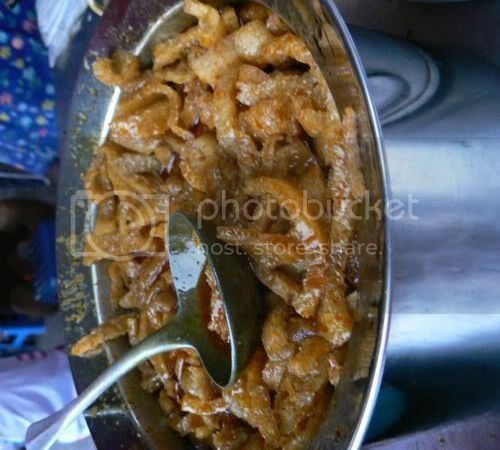 The must have is their curried pork rinds as the curry sauce is made by them. Unlike the curry sauce you get in most stalls, this curry has a dash of coconut milk only. However it's aromatic with the rempah they use to make the curry. Eat it with Pak Koh and you will definitely be asking for second helpings. 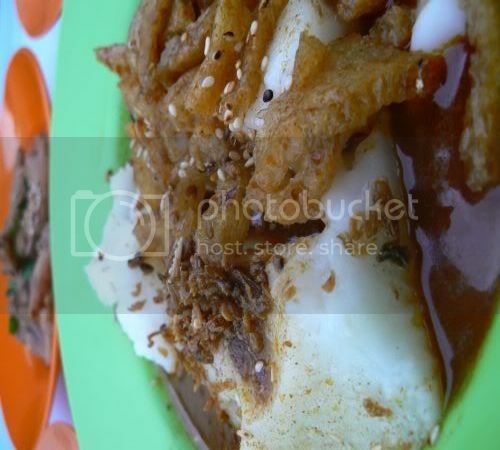 You can also eat it with the chee cheong fun. Although they don't make their own chee cheong fun (steamed rice rolls), they have paired it off with these excellent deep fried baby shrimp. It's a far cry from the usual sesame seeds we get in most stalls but the crunchy and aromatic baby shrimp is addictive. 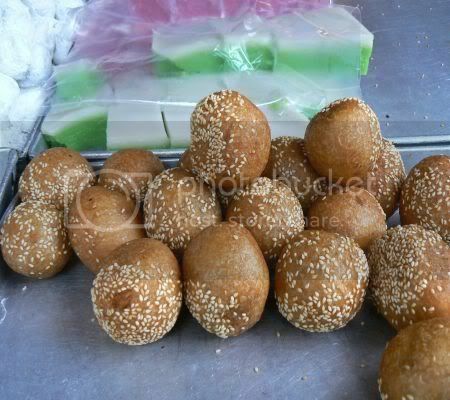 Puspha mentioned their Nyonya Kueh they serve here is famous hence I have included a picture of it. I didn't try any of the sweet items since we had earlier eaten the steamed egg custard. Prices are extremely reasonable here, it's RM1.20 for a small portion and RM2.40 for a large portion. The curried pork rinds and soy sauce chicken feet is RM1.20 for a small plate.